As you have probably noticed, dry eye is a very hot topic these days. It’s so hot that a cottage industry of fee-based dry eye training programs have cropped up. 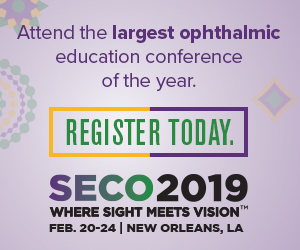 This is in addition to the glut of more traditional dry eye CE programs, where most training has typically occurred in the past. Don’t misunderstand, some of these programs are great, created by brilliant and successful clinicians who want to share their expertise and knowledge. Others are a totally confusing hodgepodge of discordant, clinically questionable advice driven more by sponsorship and profit potential than knowledge or a true desire to empower colleagues by sharing it. Despite all these opportunities for education, the growing challenges our profession faces, and the stunning number of patients whose lives have been disrupted by dry eye—especially in younger populations, the reality is that dry eye remains a red-headed stepchild for most eye care providers. It’s not that optometry and ophthalmology lack real or, sadly, in some cases, self-proclaimed dry eye experts. We also have more than enough guidance documents to aid the development of true clinical expertise. For example, the 2017 DEWS II tome is a comprehensive compendium of all things related to dry eye, MGD and tear dysfunction. While it serves as a wonderful educational tool containing the knowledge and perspective of true content experts from around the world, I suspect its complexity seems so overwhelming and daunting that it scares some clinicians away. For those who are truly expert, dry eye—or what we call dry eye—is among the most complex of disease states. The tears are a lot more than salty water, and the ocular surface and the blink are masterpieces of nature’s engineering. Effectively treating severe dry eye can be extremely challenging. However, thankfully, most patients with mild or even moderate dry eye disease can be diagnosed and managed simply and effectively with a small number of products, medications and devices. A retrospective, interventional case series including 134 eyes underwent implantable phakic contact lens (IPCL) implantation for correction of myopia and myopic astigmatism at a tertiary eye care hospital in South India to review the safety of the IPCL for correction of myopia and myopic astigmatism. Intraoperative and postoperative complications were analyzed. The following parameters were analyzed at preoperative and one-, six- and 12-month postoperative visits: visual acuity (in logMAR) and manifest refraction, slit-lamp bio microscopy, dilated fundus examination, IOP and endothelial cell density measurement. No intraoperative complications were noted. Cataract was the most common postoperative complication, wherein three eyes (2.2%) underwent observation for visually insignificant anterior subcapsular cataract, and one eye (0.7%) required surgical intervention. Four eyes developed transient increased IOP due to steroid response (three eyes) and pupillary block glaucoma (one eye). The endothelial cell loss noted over a one-year follow-up was 2.01% ± 4.12%. One eye developed hypopyon on the third postoperative day, which resolved subsequently with an unaided vision of 20/20. No vision-threatening complications were noted. The mean follow-up in the cohort was 25.66 ± 16.45 months. Researchers wrote that the IPCL was a safe and effective treatment modality for correction of myopia and myopic astigmatism. SOURCE: Sachdev G, Ramamurthy D. Long-term safety of posterior chamber implantable phakic contact lens for the correction of myopia. Clin Ophthalmol. 2019;13:137-142. This study investigated the response of dissolving collagen contact lenses as an alternative for bandage contact lenses, for the post-interventional care of epithelial defects after corneal cross-linking (CXL) treatment for keratoconus. Follow-up visits were performed at day one, four and one month after the intervention. Investigators reviewed notes for re-epithelialization, comfort/pain and any untoward effects of Collagen Soft Shield. Assessments included visual acuity (VA) and refraction (SE); and corneal haze, epithelial erosion and pain status were assessed subjectively on a four-point scale, from 0 (none) to 3 (severe). Thirty consecutive CXL patients with collagen shield application after CXL were included. Mean age was 28 years (range, 16 to 51 years old). Pre-CXL VA was 0.7 logMAR IQR 0.4 to 1; post-CXL VA at day four and month one was 0.6 logMAR IQR 0.4 to 0.9. Post-operative mean SE was 5.5D ± 4.1D. In all patients, the Collagen Soft Shield was completely dissolved at the four-day follow-up visit. In most cases, epithelial defect was closed at day four, on average 0.8 ± 0.5 days post-intervention; all epithelial defects were closed by month one. Haze was minimal (mean haze score 1.4 ± 0.7 at day four and 1 ± 0.6 at one month). No adverse effects such as infection were observed. Investigators determined that the results indicated that Oasis Collagen Soft Shield was a valuable and safe alternative to standard bandage contact lens for the treatment of epithelial defects. They added that this outcome might be of particular interest for patients in whom contact lens removal was likely to be problematic. SOURCE: Guber I, Bergin C, Malde S, et al. First experience with Oasis Collagen SOFT SHIELD® for epithelial defect after corneal cross-linking. Int Ophthalmol. 2019; Jan 18. [Epub ahead of print]. Researchers evaluated the effect of different intraocular pressure (IOP)-lowering interventions on contact lens sensor (CLS) parameters and their relationship with Goldman applanation tonometer (GAT)-measured IOP reduction. Data from reliable CLS recordings performed before and after IOP-lowering interventions were analyzed. Three interventions were evaluated: topical medications, laser trabeculoplasty and incisional surgery. A set of 115 different CLS parameters were derived from 24-hour curves. Investigators compared before vs. after values for each parameter. In addition, linear regression was performed using the percentage change of each CLS parameter as the outcome variable and the type of IOP-lowering procedure as the predictor after adjusting age and race. Finally, investigators assessed the relationship between changes in CLS parameters and GAT IOP with Spearman's rank correlation coefficient. A total of 182 eyes of 182 patients were included in the analyses with the following therapies: 60 (33%) topical medications, 69 (38%) laser and 53 (29%) surgery. The mean GAT IOP change was 3.6mm Hg ± 6.5mm Hg. Overall, more CLS parameters had a significant change after surgery than in the other groups (surgery>laser=drug). Linear regression showed that, for 20 CLS parameters, surgery was the most predictive of greatest percentage change in CLS signals. 11 (9.5%) of CLS parameters were significantly correlated with GAT changes. Incisional glaucoma surgery had a more pronounced effect on GAT and CLS parameters than laser and drugs. Investigators wrote that the CLS could detect changes in patterns resulting from IOP-lowering interventions beyond day-time GAT IOP. They added that this device could potentially be used to assess treatment efficacy in glaucoma. SOURCE: Cutolo CA, De Moraes CG, Liebmann JM, et al. The effect of therapeutic iop-lowering interventions on the twenty-four hour ocular dimensional profile recorded with a sensing contact lens. J Glaucoma. 2019; Jan 11. [Epub ahead of print]. Bausch + Lomb introduced the Zen Multifocal scleral lens for Presbyopia, which will be exclusively available with Zenlens and Zen RC scleral lenses through the company’s Specialty Vision Products unit. This latest innovation will enable eye care professionals to fit presbyopic patients who have irregular and regular corneas, as well as those with ocular surface disease, with ADD power ranges from +1.00D to +3.50D in 0.25D steps. Building upon the Zenlens and Zen RC scleral lens technology, the new Zen multifocal scleral lens incorporates decentered optics, enabling the near power to be positioned over the visual axis. The multifocal design also offers variable near zones from 1.5mm to 3mm in 0.5mm steps. Read more. Bruder Healthcare announced the availability of Eyeleve, the first contact lens compress designed to increase comfortable contact lens wear time by up to three hours daily. The compress is intended to deliver consistent, therapeutic moist heat to alleviate symptoms of meibomian gland dysfunction and contact lens-related dry eye. By stimulating glands and increasing oil production, the compress helps stabilize the ocular surface to reduce dryness and extend comfortable wear time of contacts. A clinical study at the the University of Alabama at Birmingham School of Optometry found that subjects using Bruder masks with MediBeads technology had significantly improved meibomian gland scores and experienced steeper declines in their overall Eye Discomfort Assessment scores. They increased comfortable wear time of their contact lenses by up to three hours by using the compress. Read more.